Say Goodbye to All That Grass in Dutchess County, NY! Do you find yourself singing that old song every summer..."I fought the lawn and the lawn won..." How many hours do we spend fertilizing, mowing, raking, watering and killing weeds only to go away for vacation and come home to yellow patches. How many hours do you spend every Spring, carefully fine-tuning the irrigation, monitoring it like a Ninja outside to ensure every blade gets a drink, only to have the kids or you hit a sprinkler head unknowingly with the lawn mower and throw all your perfection out the window?! Many websites are showcasing how to transform your traditional lawn into a luscious garden space. Many pear and apple varieties survive well in colder climates. Taking out the lawn or building raised beds on top is another option. Having some organized garden boxes situated where your big lawn used to be will provide you with practical and visual interest. Trading in your dead or expensive to maintain lawn for a plethora of organic groceries is a smart idea. Perhaps you love the sound of waterfalls and wish to recreate some relaxing space in your yard. This can potentially become an outdoor office, an outdoor dining space or simply your Zen retreat. If you are thinking of having Koi or goldfish in your pond, ensure that you have a deeper area for them to hibernate in during the winter months. Consider planting some aquatic plants such as blooming lily pads and cattails in the pond to attract butterflies, dragonflies and the local bird population. Laying a stone patio and matching BBQ area, bar, couches, or a complete outdoor kitchen with granite countertops and pergola overhead is a fun way to transform your previous lawn. Expanding your Dutchess County living space by building an outdoor kitchen is excellent for entertaining. You will keep your house cooler while cooking in the summer too. Have some fun selecting suitable concrete pavers for your patios and walkways and incorporate a matching fire pit. Create an outdoor living space at your Hudson Valley home that is less maintenance than grass and far more enjoyable! 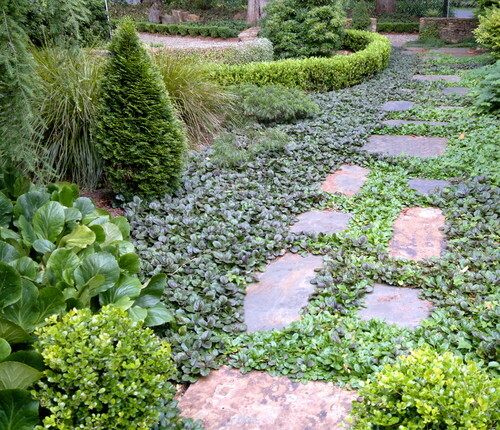 Of course, if doing a major backyard renovation is not in the budget or your timeframe, or you prefer the look of vegetation, consider planting ground cover plants instead of grass. There are numerous varieties of different heights and colors. Take a trip to the local garden center or nursery or reach out to us here at Harmony Hill Landscaping to discuss what thrives here in Dutchess County, NY.